Erbil, Kurdistan Region, Iraq (cabinet.gov.krd) – Kurdistan Region Prime Minister Nechirvan Barzani received Mr. Stefan Löfven, Swedish Prime Minister and his accompanying delegation. In the meeting, attended also by Kurdistan Regional Government Deputy Prime Minister Qubad Talabani and a number of ministers and senior officials, Prime Minister Barzani expressed his gratitude to the Swedish government for its humanitarian assistance and providing training and military expertise to the Peshmerga forces. He also discussed the cooperation between the Peshmerga, Iraqi army and the coalition forces in the ongoing operation to liberate the city of Mosul. He stressed that the future of the political process in Iraq and the post-ISIS administration of Mosul, are as important as the liberation of the city itself. He stressed that Iraq needs a serious dialogue on its future and coexistence among its communities. Prime Minister Löfven commended the Peshmerga forces for the victories they achieved against the ISIS terrorists, stressing that Sweden will continue its assistance to the Kurdistan Region. He reaffirmed the importance of dialogue between Iraq and the Kurdistan Region on the post-Mosul-liberation era. Deputy Prime Minister Talabani discussed the political process in Iraq and the issue of the internally displaced people, fleeing Mosul and other parts of Iraq to the Kurdistan Region. While he thanked the Swedish government for its assistance, he stressed the importance of the continuation of international aid to the Kurdistan Region after the defeat of ISIS. Deputy Prime Minister Talabani expressed his government’s concern that after the liberation of Mosul, the international community may not continue its aid to the refugees and IDPs as needed. Prime Minister Löfven affirmed that providing assistance to refugees is an international issue, and hoped that the international community will deal seriously with this issue in the Kurdistan Region. Erbil, Kurdistan Region, Iraq, (gov.krd/Presidency.krd)- Kurdistan Region President Masoud Barzani yesterday received a United States defense delegation headed by the Secretary of Defense, Mr. Ashton Carter. The US delegation included also Mr. Brett McGurk, the Special Presidential Envoy for the Global Coalition to Counter the Islamic State of Iraq and the Levant. The meeting was attended by a number of Kurdistan Region senior officials including Kurdistan Regional Government Prime Minister and the Chancellor of the Kurdistan Region Security Council. At the meeting, the two sides discussed the latest developments in the military operation to liberate the City of Mosul from Islamic State terrorists. 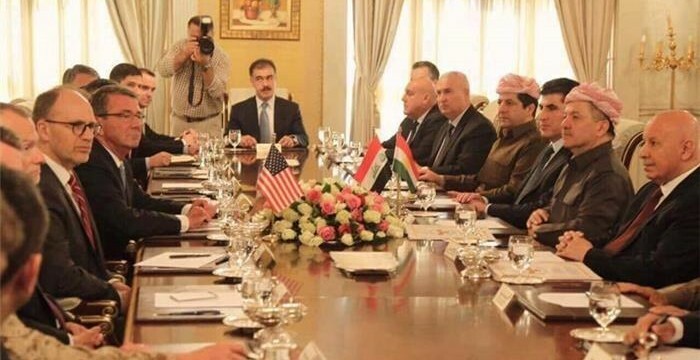 They stressed the importance of continuing cooperation between the United States government, the Iraqi federal government and the Kurdistan Region, on the basis of the agreement reached between the three parties. Secretary Carter praised the role of the Peshmerga forces in this war, under the leadership of President Barzani, who played a crucial role in significantly weakening the Islamic State terrorists. President Barzani conveyed the Kurdistan Region’s appreciation to the people and government of the United States for leading the coalition against the Islamic State terrorists. Luxemburg City, Luxemburg (dfr.gov.krd) – KRG Foreign Minister Falah Mustafa Bakir arrived in Luxemburg City on Thursday, October 20, 2016 upon an official invitation by the Minister of Foreign Affairs of Luxembourg, Mr. Jean Asselborn. Both Ministers spoke in detail of the current regional security, humanitarian and political developments. They also shared views on enhancing bilateral ties in different fields. 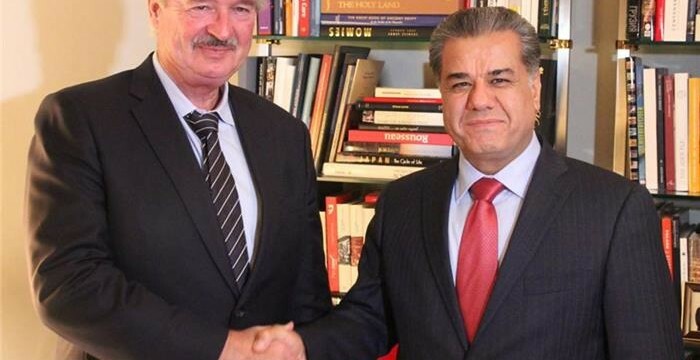 Minister Asselborn welcomed the generosity of the people and government of the Kurdistan Region in hosting 1.8 million Iraqi displaced people and Syrian refugees. Minister Asselborn assured Minister Mustafa that Luxembourg would continue to provide humanitarian aid to the displaced persons in Iraq. He also highlighted the role of Peshmerga in the fight against ISIS, and particularly welcomed the participation of Peshmerga forces in the fight to liberate Mosul. The Hague, the Netherlands (dfr.gov.krd) – KRG Foreign Minister Falah Mustafa on Wednesday met with Minister of Foreign Affairs of the Netherlands Bert Koenders in the Hague to discuss bilateral ties as well as recent military and humanitarian developments. Minister Koenders highly spoke of the role of Kurdistan Region in the fight against ISIS terrorists and in caring for Syrian refugees and Iraqi displaced people. The Dutch Minister reiterated the commitment of his government to continue supporting Kurdistan at both humanitarian and military levels. Both Ministers discussed bilateral ties and areas of potential cooperation in order to increase economic and investment cooperation. The KRG Minister thanked the Dutch government for providing humanitarian and military support to Kurdistan Region and stressed the need to receive further and continued support from the international community. He briefed Minister Koenders on the developments in regard to the ongoing fight to liberate Mosul as well as the humanitarian fallout from the operation. Both Ministers also discussed the Post ISIS era and the need for a new political arrangement that could guarantee inclusiveness. Today, the Kurdistan Regional Government Peshmerga and security forces launched an operation to liberate the City of Mosul. This is an important event for the entire world since ISIS used the city as a launching pad for attacks against the region and the world. Having this important Iraqi city as their stronghold, ISIS was able to attract extremists to its ranks. In coordination with the coalition forces and the Iraqi government, Peshmerga forces launched the operation to liberate the city today. The Peshmerga forces, led by the President of Kurdistan Region and Commander in Chief of the armed forces Massoud Barzani, crushed the myth of ISIS in Kobane and Sinjar that marked the beginning of the terrorist group’s fall elsewhere. Today, under President Barzani’s command, the heroes of Peshmerga forces started the largest operation to destroy ISIS. In the past two and a half years and with limited capabilities, the Peshmerga forces have displayed unmatched resilience and heroism against the most dangerous terrorist organization in the world. The Peshmergas also protected the humanity from a major threat. Therefore, the international community should recognize the role of the Peshmergas and respect their sacrifices. Despite the financial and economic challenges, the Peshmergas and their families’ sacrifices have become a source of honor for the people of Kurdistan. The liberation of Mosul will only solidify Peshmergas’ pride and admiration as the guardians of the free world in the face of a barbaric force that threatens the freedoms and the stability of the world. The Peshmergas are proud to protect all different ethnic and religious groups in the region and they are proud to fight to protect the free world. The Presidency of the Kurdistan Region and the Kurdistan Regional Government have displayed a great deal of flexibility to reach an agreement with the Iraqi government to make sure that the operation of liberating Mosul will succeed. The Kurdistan Region has fulfilled all its obligations within the international coalition against ISIS and provided assistance for all international organizations and local and international media agencies to cover this global war against ISIS terrorists. Despite the financial crisis in the Kurdistan Region, it has sheltered more than two million Syrian refugees and Iraq’s internally displaced persons, increasing the population of the region by 32 percent. The Kurdistan Region has been hosting and providing for these refugees and IDPs without receiving adequate assistance. Today, the major operation started, however it’s a reminder that the global security is integrated and connected together. The emergence of ISIS in Iraq and Syria has become a threat against the entire world and the dangers of this group is no longer limited within the borders of a number of countries. In order to destroy ISIS and prevent the emergence of similar groups, the countries in the region and the international community must work together to find permanent solutions for countries whose disputes and problems provide a ground for such organisatoins to emerge and thrive. Therefore, a carefully designed system is greatly needed to administer the region after ISIS, along with finding political solutions for standing issues. The Kurdistan Regional Government is ready to play a major role in securing a peaceful solution in the region. As the operation to liberate Mosul is underway, we salute the Peshmergas and we ask God to bless them along with all Iraqi and international coalition forces fighting to free Mosul and its surroundings. We ask God to protect the civilians of Mosul and its surroundings. We pray that Mosul once again reclaims its position as a main and advanced city in the region, spared from destruction. At approximately 0600hrs on 17 October 2016 a large-scale, coordinated operation was launched by Peshmerga Forces in Khazir, East of Mosul, with Iraqi Security Forces from Gwer and Gayyara, both South of Mosul, as the first step to clear Ninewa province from ISIL terrorists. The operation in Khazir includes up to 4,000 Peshmerga in three fronts to clear nearby ISIL-occupied villages as part of the agreement between the Kurdistan Region and the Iraqi Federal Government. Global Coalition warplanes have pounded ISIL positions as of 16 October and will continue to provide close air support throughout the operation. Local, regional and international media outlets have been embedded with Peshmerga Forces. Operational updates will be issued every six to eight hours. Erbil, Kurdistan Region, Iraq (cabinet.gov.krd) – Kurdistan Regional Government Prime Minister Nechirvan Barzani praised the role of the private sector in stimulating Kurdistan’s economy, as the region is dealing with financial challenges. Welcome to the opening ceremony of the third conference of the Kurdistan Federation of Chambers of Commerce and Industry. A special welcome to Mr. Adnan Al-Qasar, the Honorary President of Arab Chamber for Commerce and Industry, and participants from neighboring and friendly countries. It is my wish to see this conference provide a favorable and successful platform to the participants. I commend the organizers of this conference in Erbil. The role of the private sector in revitalizing the Kurdistan Region’s economy, which is the title of this conference, is an important issue and has always been a priority of the Kurdistan Regional Government. The Kurdistan Regional Government believes that the private sector could play a major and important role in developing, reviving and diversifying the Kurdistan Region’s economy. Therefore, the government has provided incentives for local and foreign companies and created major job and investment opportunities in all sectors. The Kurdistan Regional Government is also exploring more options to provide more opportunities and further empower the private sector. The government is considering to gradually privatize certain public services, which will provide more opportunities for the private sector. The privatization policy, especially during economic and financial challenges, will ease the burden on the regional government and help revive the economy of Kurdistan Region. Lessons from the developed countries show that the private sector could play a major role in improving industry, agriculture, tourism and other sectors, and could become a cornerstone of a strong economy. In order to achieve that, the private sector needs the support and oversight of the government by having laws and regulations that encourage labor and investment, whether for major and strategic projects, or for medium and small businesses. The role of the private sector becomes more prominent during crisis and economic hardship, as we have seen in the Kurdistan Region. As you are aware, Baghdad’s decision to cut the Kurdistan Region’s share of the federal budget, the war against ISIS terrorist organization, hosting more than 1.8 million Syrian and Iraqi refugees and internally displaced persons, and the drop of oil prices, all contributed to creating a major economic and financial crisis that has affected all aspects of life in the Kurdistan Region. Due to these reasons, which are beyond our control, dozens of projects have been halted. As a consequence, jobs, businesses and the daily life of citizens have been hurt. However, despite these challenges, Kurdistan’s economy is still functioning, thanks to the private sector. Tens of thousands of workers, which provide for thousands of families, are still working in the private sector. If not for the budget cut, ISIS war, high number of refugees, which puts a huge financial burden on the government, and drop of oil prices, the Kurdistan Regional Government could have provided more support and coordinated better with the private sector, and could have had a stronger and more robust economy. As we mention these reasons, we don’t mean to say that we are free of any shortcoming. The weakness of our administrative system, high expenditures, multi-salaries, excessive hiring, and other faults in our administrative and financial management systems also contributed to the financial crisis. We need to admit that and address these issues. The financial crisis is a major challenge that is hurting the government and the people of Kurdistan Region and Iraq; however, it offers a golden opportunity to reform our administrative and financial systems. The Kurdistan Regional Government is very serious to make the best use of this opportunity to reform its systems. The Kurdistan Regional Government’s vision for 2020, which has been drafted with the help of the World Bank, along with indicators and recommendations of the World Bank, which are in accordance with global standards and benefit investors and private sector, are an integral part of the Kurdistan Regional Government’s policy to further strengthen the private sector in the Kurdistan Region. If we examine the Kurdistan Regional Government’s policy of supporting the private sector, we find that there has been major improvements in economic indicators between 2004 and 2013. For example, a year after the fall of Saddam Hussein regime in 2003, the unemployment rate was 10.4 percent, and it had declined to 5.2 percent in 2013. And in 2006, about 20,000 jobs were created in the private sector, but in 2012 the number had increased to 340,000 jobs. Per capita income had increased from $500 in 2003 to $5,000 in 2012. In 2007, the total investment in the Kurdistan Region was four billion dollars. Today, that number stands at 47 billion dollars, with many investments in industry, housing and tourism sectors. The government’s policy and the support it offers are the main incentive for investment in the Kurdistan Region. Only the local private sector market has 669 investment projects, worth $37 billion. This is an indication that the private sector trusts the government and its supportive policy in further boosting the role of the private sector in the Kurdistan Region. One of the aims of the government’s plan to overcome the current challenges is to further support the private sector in order to grow its activities effectively and efficiently, generate further income and attract more job seekers instead of the public sector. The government will exert all its efforts to meet this objective. I hope that the researches and studies presented in this conference will provide constructive recommendations that would help implementing the Kurdistan Regional Government’s policy to further support the private sector. The Kurdistan Regional Government also works to remove all the obstacles that had hampered the private sector’s growth; namely those legal and constitutional obstacles under the Iraqi laws related to financial policy, commerce and customs along the borders and in the provinces of the Kurdistan Region. We have examined laws and issued various regulations to help the private sector to play a greater role in building and developing our economy. In the past, based on observations and recommendations by the private sector, we amended some laws and regulations and will continue to do so until the private sector is able to provide its most effective contribution to the country’s economy. The recent visits by the Kurdistan Regional Government delegation, President Barzani and his accompanying delegation to Baghdad, holding meetings with the Iraqi Prime Minister Haydar Al-Abbadi and other senior officials, have created hope and opportunity to settle the disagreements with the Iraqi government. We hope that we reach an agreement, through dialogue and mutual understanding, on all standing issues, including the nature of the future relations between Kurdistan and the Iraqi state, in a way which serves the interests of the citizens of Kurdistan Region and Iraq. It’s important to us that our friends and brothers in Baghdad know that the current situation cannot continue. Through dialogue and mutual understanding, we must reach an agreement on our future in Iraq and assure that stability continues across Iraq. As the preparations, at both local and international levels, are underway for the liberation of the city of Mosul, this operation will have direct impact on the situation in the Kurdistan Region, particularly in the economic, investment and commercial domains. After the liberation, we hope to see more Iraqi and foreign businesses invest in the Kurdistan Region. But we should not forget that Mosul issue is more a political issue than a military one. Liberating Mosul militarily will not settle the issues of this province. It is true that the capital of what ISIS calls Caliphate or the Islamic State will be liberated from the terrorists. However, what is more important is the post-liberation period, for which all its ethnic, religious and sectarian components should play a role in the political process and have a say on the future of their region and the way it will be administered. If this is not done, rather than solving the current problems, additional problems will certainly surface. Therefore, this important and sensitive issue should be settled now through an agreement among all the components of Mosul. In the end, I welcome you again and wish to see the conference achieve its goals. I commend the Kurdistan Federation of Chambers of Commerce and Industry, its president Mr. Dara Jalil Khayat and his colleagues as well as the Kurdistan Centre for Information and Strategic Research for having organized this conference. I hope its outcome will contribute to improving the situation in the Kurdistan Region and solidifying the role and position of the private sector in the Kurdistan Region. I congratulate Erbil Chamber of Commerce and Industry as it celebrates its 50th anniversary. I would like to convey my condolences to the families of the martyrs and salute our fallen heroes, whose ultimate sacrifices protect Kurdistan and its bright future. I also wish a speedy recovery for the injured. I express my gratitude to the heroic Peshmergas and all members of the security forces of the Kurdistan Region. Thanks to their heroism and sacrifice, our country is safe and secure today. I express my gratitude and appreciation to the people of Kurdistan, all the public servants and pensioners who understand the magnitude of the challenges facing our country and have remained resilient. We reassure everyone that we will overcome the current situation and a bright future is waiting for Kurdistan. Erbil, Kurdistan Region, Iraq (cabinet.gov.krd) – Kurdistan Regional Government Prime Minister Nechirvan Barzani received the new Consul General of The Netherlands to Erbil, Ms. Janet Alberda. Ms. Alberda expressed her wishes to enhance bilateral relations between the Kurdistan Region and The Netherlands. She commended the effectiveness of Peshmerga Forces in the fight against the Islamic State terrorist organization, ISIS. She welcomed the recent steps taken to improve the relations between the Kurdistan Region and Baghdad, expressing her hope that all issues will be settled through mutual understanding. Regarding the situation of internally displaced persons, IDPs, Ms. Alberda stated that along with the Dutch Ambassador to Iraq, she will visit IDP camps in order to closely observe their conditions and assess their needs. The Kurdistan Region hosts close to 1.8 million displaced people and refugees who have fled ISIS terrorists. Many more are anticipated to flee to Kurdistan Region from Mosul during expected military operations to liberate the city from ISIS. Prime Minister Barzani expressed his government’s appreciation for the assistance provided by The Netherlands Government to the Kurdistan Region, particularly in the military field. He highly valued relations with The Netherlands. Regarding relations with Iraq’s federal government, he stressed that his visit last month and later by Kurdistan Region President Masoud Barzani to Baghdad had positive repercussions, reaffirming that discussions will continue. Bilateral relations and the expected military operation to liberate Mosul and its aftermath were also discussed.